In an interview with Citizen Matters done in 2016, Rajendra Kumar Mishra, popularly known as R K Mishra, had said that the proposed elevated corridor project would encourage public transport. This was at the height of the public opposition to the proposed Steel flyover where the pros and cons of flyovers were being hotly debated. In the last part of our four part series on the Steel Flyover/ elevated corridor projects, we spoke to Misra, who as a member of the Chief Minister’s Vision Group, had batted for the Elevated Corridor Project. 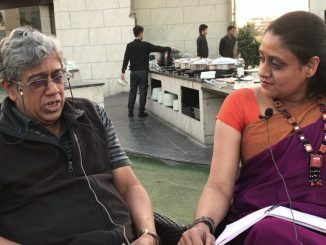 Despite his support for the 92 km north south corridor, Mishra insisted that he was no fan of concrete or steel. “I am for public transport. I wrote the Electric Vehicle Policy for Karnataka and even demanded that that there be a priority lane (not like the BRTS which is a dedicated lane) for buses. The elevated corridor will free up space on the at grade road and allow for priority lanes for buses that will automatically bring the traffic down,” he added. He also added that he has been pushing for BMTC to increase their bus fleet strength. “Why don’t we have twelve thousand buses to encourage public transport? Have a priority lane for the buses and if we can get that done, I will be the first guy to say scrap the elevated corridor project. If I had to choose between 12,000 buses or the Elevated Corridor project, I’d choose the former,” he said. So why didn’t he do just that? When quizzed about why he pushed for the elevated corridor project instead of more buses for the city, Misra said that he has failed. “I tried and failed. The priority lane for buses did not happen because the traffic police did not cooperate,” he said. 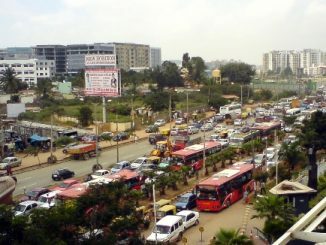 Misra’s opinion was that, the traffic chaos in Bengaluru could be blamed on the lack of political will, and the non-cooperation of the traffic police. However the question remains as to why, when it was possible to push for a Rs 25,000 crore elevated project, it seems to be difficult to execute simpler and more cost-effective measures for traffic decongestion including more buses, with the government. Manasi Paresh Kumar is Engagement Editor for Bengaluru Citizen Matters. Metro works are progressing fast, while BMTC is adding more buses. All in all, the scene looks bright on paper. Here is a round up of mobility issues of Bengaluru in 2017. When illegal maxicabs, vans serve the public, why not regularise them? 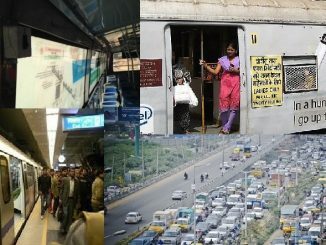 Here’s how an archaic transport policy ensures Bengalureans’ need for public transport is not adequately served, and bans out of the box solutions. There is bound to be a strong reason for people who support elevated roads in their own backyard to oppose ‘steel flyover’ in another area. Such complex arguments can never be classified into binaries. Here’s a slice of such complexity simplified for clarity. There are already sufficient buses in this route, adding more buses may not solve the problem.the first bottle neck is in the middle of hebbal fly over the connecting loops of tumkur road and white field roads. the vehicles coming from these roads blocks the vehicles from air port and yelahanka.in busy hours each vehicle in these spots spends an average of 20 seconds the pile up behind is about 300 vehicles .imagine the delay time.it is 300x 20sec .so make provision for these loops below the fly over.there is railway gate open it or make an under pass. the next bottle neck is at kaveri junctio and bda .make an under pass plenty of land is there. Everybody blabbers about Public transport, but Mr Mishra himself would use a car for travel. Second thing those who don’t have any knowledge about Traffic and Transport is commenting on it. I do agree with him, saying that the project is politically driven, but still BMTC is one of the best performing STU’s in the country. Please do hire or take inputs from the learned in the field and then comment on the decision.